When I first picked up Robert Harris’ Fatherland in my local independent bookshop in 1992, I was fascinated by the concept of ‘what if Nazi Germany had won the war?’ What would have been the alternate path of history? Fatherland was intrinsically a political thriller. In 1992, the whole of Europe was attempting to realign after the exhilaration of the fall of the Berlin Wall in 1989 and dissolution of the East/West Iron Curtain imposed after the Second War World. Perfect timing by the astute political journalist, Robert Harris. Fatherland went on to become an best-seller immediately and ever since. The story begins in April 1964 in a Nazi Germany which won the Second World War. It’s the week leading up to Adolf Hitler’s 75th birthday and shortly before his meeting with American president Joseph P Kennedy (JFK’s father in our world). The plot follows police detective Xavier March as he investigates the suspicious death of a high-ranking Nazi. As March uncovers more details he realises that he is caught up in a political scandal involving senior Nazi Party officials, who are being systematically murdered under staged circumstances. As soon as the body is identified, the Gestapo claims jurisdiction and shuts down March’s investigation. March meets a female American journalist who is also investigating the case. Ultimately, the two uncover the horrific truth behind the staged murders. At its best, alternate history challenges fixed ideas while providing entertainment. In Fatherland, we enjoy the frisson of terror at the nightmare of what could have been. Readers, especially those who haven’t tried an ‘althist’ book before, are intrigued by the different setting and the ‘what if’ trope, but are still after a cracking good story with emotional grip. Xavier March, homicide investigator with the Berlin Kriminalpolizei – the Kripo – climbed out of his Volkswagen and tilted his face to the rain. He was a connoisseur of this particular rain. He knew the taste of it, the smell of it. It was Baltic rain, rain from the north, cold and sea-scented, tangy with salt. For an instant he was back twenty years in the conning tower of a U-boat, slipping out of Wilhelmshaven, lights doused, into the darkness. 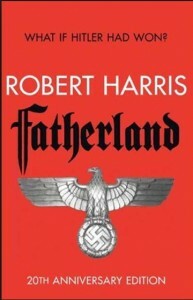 According to Robert Harris, in an interview with The Guardian, Fatherland attracted heaviest outrage from Germans who castigated Harris for ‘trivialising’ their history; thirty publishers in Germany refused to handle the book. Das Spiegel magazine ran a six-page denunciation of Fatherland which ensured it became a bestseller in Germany. My own ‘what if’ story was bubbling away in my head, more as a fantasy than a concrete idea for a book, but the idea of bending and extending history as Robert Harris had done planted itself beside it. It spurred me on to find other such stories such as Keith Roberts’ Pavane about an England after being defeated by the Spanish Armada, Kingsley Amis’ The Alteration and Michael Chabon’s The Yiddish Policemen’s Union. Historic novelist C J Sansom took up the ‘what if Nazi Germany had won the war’ theme in Dominion, but used ordinary people as the carriers of the narration while using the great smog of 1952 (which really happened) as a symbol of obfuscation. Clever stuff. 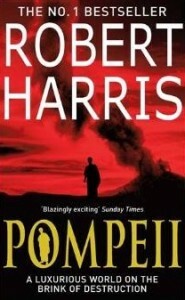 In 2003, Harris turned his attention to ancient Rome with his acclaimed Pompeii which has become another international best-seller. He followed this in 2006 with Imperium, the first novel in a trilogy about Roman orator and politician Cicero. The second novel, Lustrum, was published in October 2009 (Conspirata in the US).The third and final novel, when it does appear, is already on my to-be-read pile. Pompeii, centres on Marcus Attilius, an ordinary engineer placed in charge of the massive aqueduct that services the tens of thousands living close packed around the Bay of Naples. Quiet, expert, and stubborn, Marcus has to face the facts that his predecessor in the job vanished mysteriously and that the towns’ wells and springs around the whole bay are failing. On top of this, the greatest aqueduct in the world – the mighty Aqua Augusta – has suddenly ceased to flow. Marcus is tasked by the scholar Pliny to undertake crucial repairs to the aqueduct, all under the shadow of the restless Mount Vesuvius. For me, Harris’ genius for narrative is pronounced in this work. He reached for the decanter but stopped, his hand poised in midair. The heavy crystal glass was not merely shaking now: it was moving sideways along the polished wooden surface. He frowned at it stupidly. That couldn’t be right. Even so, it reached the end of the sideboard and crashed to the floor. He glanced at the tiles. There was a vibration beneath his feet. It gradually built in strength and then a gust of hot air passed through the house, powerful enough to bang the shutters. An instant later, far away – but very distinctly, unlike anything that he or anyone else had ever heard – came the sound of a double boom. Newer work includes The Ghost, a thinly disguised story of the recently unseated prime minister, Tony Blair. Harris adapted the book with Roman Polanski for a 2010 film starring Pierce Brosnan, Ewan McGregor, Olivia Williams and Kim Cattrall. For me, it echoed the political conspiracy, corruption and twisted allegiances in the Roman novels centred on Cicero. So who is Robert Harris? Born in Nottingham, Harris spent his childhood in a small rented house on a Nottingham council estate. His ambition to become a writer arose at an early age, from visits to the local printing plant where his father worked. Harris read English literature at Selwyn College, Cambridge, where he was president of the Union and editor of the student newspaper Varsity. He became a columnist for the Sunday Times, but gave it up in 1997. He returned to journalism in 2001, writing for the Daily Telegraph and was named “Columnist of the Year” at the 2003 British Press Awards. So, in conclusion, if you are looking for tight writing, excellent research and a cracking story that challenges, I don’t think you can go wrong with Robert Harris. For me, he will always be one of the triggers for writing the world of Roma Nova. I’ve always been a big Robert Harris fan too, Alison! I’m just waiting for the third part of his Roman trilogy that started with Imperium and Lustrum! Robert Harris is the one who got me interested in alternate history with Fatherland!